Home >> Lesson Plans >> Just a Minute! Help students put one minute in perspective. put the length of time one minute in perspective. write about what they learned about a minute as a result of the activities. This lesson helps students put the minute in perspective. a minute = 60 seconds. Write those equivalencies for students to see. When we think of a minute today, we might think of a TV commercial or a common expression, such as Got a minute?, Just a minute!, or In a minute. But when we say Just a minute, do we mean exactly 60 seconds? Have students place their heads on their desks. Say "Go" and then use a clock, watch, or stopwatch to measure exactly one minute. When students think one minute is up, they should quietly raise their hands without looking up. At the end of the activity, identify those students who raised their hands closest to the 60-second mark. Try the activity again. Have students place their heads on their desks. This time, ask them to quietly sit up when they think exactly one minute has passed. Have students repeat the activity in pairs or groups of three, timing one another. Have each student take several turns and record the results. (How many actual seconds had passed when each student indicated a minute was up?) Which students seem to have the best concept of a minute? If you have in your classroom Internet access and a projector that allows you to project a computer image on a screen, you can use a fun Web site as the timer for the above activities. Students will be mesmerized by the Industrious Clock! Time your "Go!" direction in the above activities to start when the "seconds" area of the Industrious Clock registers 00. How many of their spelling words can students write/copy in exactly one minute? 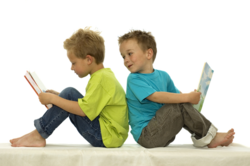 Have students read aloud a section of familiar text as fast as they can. (One of the popular Dr. Seuss books might be a good book for this activity.) Who can read the most words in exactly 60 seconds? Write ten grade-appropriate words on a chart. Give students one minute to look over the words. Then cover the chart. Give them one minute to write down as many of the words as they can remember. Which student(s) remembered the most words? The activities above might open students' eyes to how quickly a minute can pass, however, a minute can seem to pass slowly during a test of physical endurance. For example, have students stand on one foot with both hands raised above their heads for exactly one minute, or have them remain in the up position of a push-up for exactly one minute. Does a minute feel longer during some activities than it does during others? At the end of the one-minute activities, repeat the heads-down test to see if students now have a better concept of the length of a minute. We know that a day is made up of 24 hours and an hour is made up of 60 minutes. But how many minutes are in a day? Have students work in pairs to calculate the total number of minutes in a day. When they are done, see which pairs got the correct answer. (24 x 60 = 1440 minutes) Have those teams explain how they got the answer. Write a letter of the alphabet on each of 30 index cards. Have students sit in a circle, and then randomly distribute a card to each student. Give students one minute to write on the card a verb that begins with the letter on the card. Then have students pass their cards to the student on their left (clockwise!). Give that student a minute to write a different verb for the letter. When students are stumped, repeat verbs, or write words that are not verbs, they must leave the game. Have students write a couple of statements describing what they learned from the activities about the length of a minute. Give them -- you guessed it! -- one minute to think of a reply and one minute to write it down. Some students might point out that a minute seems to go quickly some times (when racing to complete a math facts test, for example) and more slowly at other times (when standing on one foot, for example). Others might note that they learned that a lot can be accomplished in a minute; that a minute can be a valuable unit of time; or that they were amazed to learn how many minutes they already have lived. Find more activities for teaching basic math skills in Education World's Math Subject Center. There you will find lesson plans for teaching math skills by using the phone book and many more fun activities. Click to return to this week's Lesson Planning article, It's About Time: Teaching Students to Tell Time.